Start treasure hunting with your own metal detector! Well since we do not have those nifflers, we will have to make do with the Budget Portable Metal Detector to find that treasure. With the help of Budget Portable Metal Detector find interesting treasure in the beach (Please no beer cans, old coins etc.). Budget Portable Metal Detector can detect metals buried as deep as 120 mm depth. An interesting tool for your inquisitive boy or girl, keep them busy at the beach with this handy detector. If you have two kids, buy two of these for them and see who get a bigger pile of nickel, gold, brass, zinc, copper, silver and aluminium stuff from under the sand. 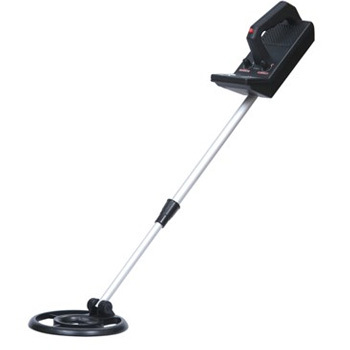 With an adjustable boom length (600 to 880 mm), this metal detector has a waterproof search coll that allows you to search for treasure anywhere. The detector comes with a cool 3.5mm headphone jack and you will know when you have found that elusive treasure as the needle indicator will point it out with a audible tone. If you are a determined treasure hunter then this is a must-have gadget for you. Place your order online right away and get on the treasure trail. Product dimensions: 67&nbsp;(H) x 11.5&nbsp;(W) x 18&nbsp;(D) cm / 7.1&nbsp;(H) x 4.5&nbsp;(W) x 26.4 (D) inches.